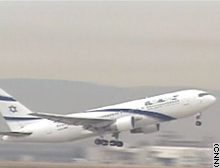 El Al has a fleet of around 30 aircraft. (CNN) -- Israel's national airline is taking new measures to safeguard passengers against missile attacks from the ground. Next month, El Al will begin equipping all of its planes with an anti-missile system called "Flight Guard" -- the first airline in the world to use such a system. When a plane comes under attack, the system responds by firing flares designed to confuse a heat-seeking missile and divert it away from the original target. The system was implemented after an incident 18 months ago in Mombassa, Kenya, when an Israeli charter jet came under attack just after takeoff. Two shoulder-fired, heat-seeking missiles narrowly missed the Boeing 757, which was carrying over 250 passengers in November 2002. Shoulder-fired missiles can be easily bought and are relatively cheap, security experts warn, and Israeli officials believe they present the next big risk to the airline industry. "So the Israeli government took the decision not to wait for another case to happen and to equip all its aircraft with counter measures," Arik Ben-Ari from the Israel Civil Aviation Authority told CNN. The planes will be equipped with a Doppler radar system, made up of four antennas at the front, two on the sides and four at the back of the plane -- capable of giving 360 degrees of radar coverage around the aircraft. Within seconds of a missile being detected, an onboard computer releases flares, firing at different angles to act as a diversion. The system is completely automated, meaning there is no involvement from the pilot or co-pilot. The reason for this is a missile attack could happen so fast that the incident could be over before the pilots could have time to react. "The time that passes is one or two seconds. [With this] time frame the pilot of such a big aircraft can do nothing. He cannot maneuver ... he cannot even react to the alert so everything has to be automatically," says one test pilot. The pilot will only be alerted that the plane was under attack once the threat is over. Already "Flight Guard" is being used by Israeli helicopters and fighter jets in combat. This technology was originally developed for the Israeli Air Force 15 years ago. The manufacturers are now waiting on Federal Aviation Administration approval before it is available for commercial airline use in the United States. But with a $1 million price tag per plane and thousands of aircraft, for many airlines the cost of the system could be a major obstacle. "Today, I haven't seen an assessment of general threat to the whole of civil aviation to say that all aircraft should be equipped," Dennis Phipps, the director of Asgard Security Management Services and the former head of security for British Airways, told CNN. "You have to assess the threat to decide what counter measures are necessary. The important thing is the shoulder-fired missile has definite limitations. For this type of missile, the aircraft is only vulnerable when the aircraft is flying under 15,000 feet and when it is coming in on a designated flight path," Phipps said. "The threat we are looking at is can a terrorist get there and get within an area near an airport that is being used? And that is something that is being assessed."